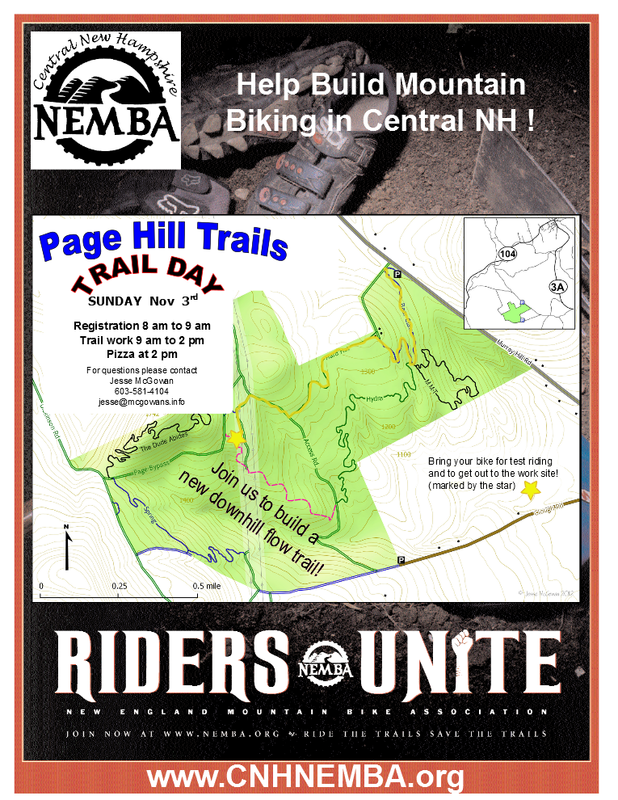 We're holding a trail day at Page Hill on Nov 3rd to build a new flow trail. We'll have registration from 8 to 9AM in the parking lot on Murray Hill Rd., work until 2PM, then CNH NEMBA will provide pizza. Please park either in the lot or on the same side of the road as the lot. The work site is a couple miles from the parking lot. I recommend bringing your bike to get out and back. It will also come in handy for testing! We'll provide tools, some light snacks, and water. You should bring work gloves and additional water. The goal for the style of the new trail is best described by the IMBA Flow Country model. We're looking for creative input on the detailed design of the trail. Please contact Jesse if you want to help out with design.